Lilacs & Lace: I am this week’s BurdaStyle Featured Member! I am this week’s BurdaStyle Featured Member! It has been a crazy week. Not only am I a finalist in the Threads Ultimate Sewing Challenge (please vote if you are willing and able! 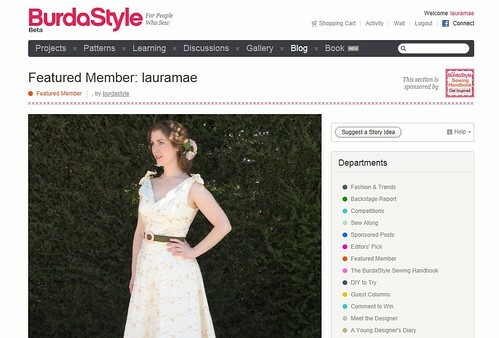 ), I am also the featured member on the BurdaStyle website this week! You can read my interview here. And I would like to say a big thank you to BurdaStyle for the opportunity! Congrats! That's how I originally became a fan of your projects, through Burdastyle. New Vintage Reproductions from Butterick!